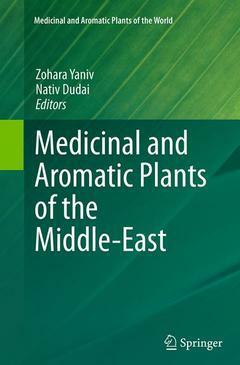 The current volume, Medicinal and Aromatic Plants of the Middle-East brings together chapters on selected, unique medicinal plants of this region, known to man since biblical times. Written by leading researchers and scientists, this volume covers both domesticated crops and wild plants with great potential for cultivation. Some of these plants are well-known medicinally, such as opium poppy and khat, while others such as apharsemon and citron have both ritual and medicinal uses. All have specific and valuable uses in modern society. As such, it is an important contribution to the growing field of medicinal and aromatic plants. This volume is intended to bring the latest research to the attention of the broad range of botanists, ethnopharmacists, biochemists, plant and animal physiologists and others who will benefit from the information gathered therein. Plants know no political boundaries, and bringing specific folklore to general medical awareness can only be for the benefit of all. Zohara Yaniv, is Prof. Emeritus at the Agricultural Research Organization. She Received her PhD from Columbia University in New York (1967) and worked for several years as a researcher at the Institute for Plant Research Boyce Thompson Center at Yonkers, NY, on topics related to biochemical control of parasite relations -host. Dr. Yaniv is an international expert on medicinal plants. Particularly interested in folk medicine related, conventional and renewable ancient cultures in the modern world. Her research work focused on ethnic botanical research of the Middle East and Israel. It also dealt with the study of vegetable oil health value crops, such as a rich source of vegetable oil omega-3 fatty acids. Her works are documented in numerous international publications. Dr. Yaniv is also the co-editor of few books: - Medicinal plants of Israel (1991 - in Hebrew, 2000 - English) - Herbs - Complete Guide to medicinal plants with drugs to disease incidence (1995). - Handbook of Medicinal Plants (2005).